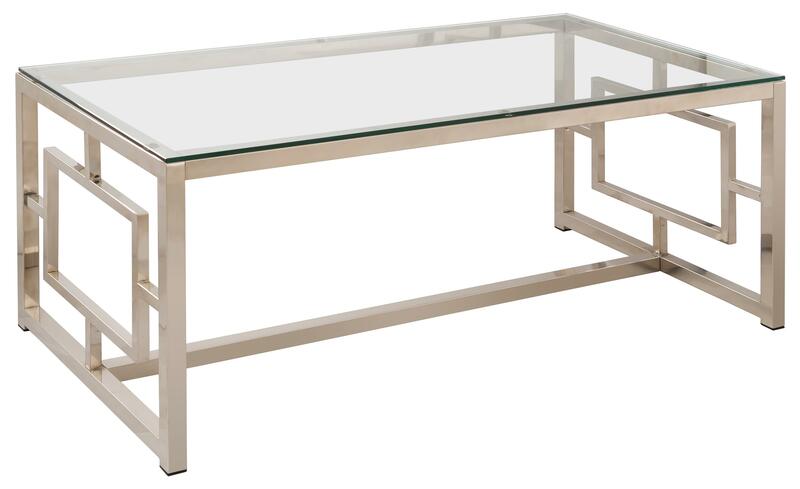 This rectangular metal coffee table with a glass top is a refreshing addition to your living room decor. It features a contemporary design with a light satin nickel finish on the metal frame. The geometric detail of the sides has a versatile appeal for any home. 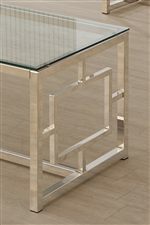 The Occasional Group Contemporary Metal Coffee Table with Glass Table Top & Geometric Motif by Coaster from Nashco Furniture - Nashville. We proudly serve the Nashville, Franklin, Brentwood, Clarksville, Green Hills, Davidson County, Williamson County, Tennessee area. Product availability may vary. Contact us for the most current availability on this product. Case Detail Straight lines with geometric detail sides. Stretcher connecting table ends. Pieces in this occasional group are contemporary in design with a satin nickel finish metal frame. Use your choice of these accent tables for a modern addition to your home that will brighten your space with a light, elegant look, thanks to the airy feeling created by the glass table tops. Metal Frame in Satin Finish with Geometric Side Detail. Glass Tops.